Chester Field (チェスターフィールド 暗黒神への挑戦, Chester Field: Ankoku Shin heno Chousen?, lit. 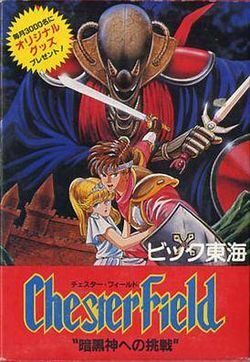 Chester Field: Challenge to the Dark Gods) is a side-scrolling adventure game developed by Vic Tokai in 1987 for the Famicom. 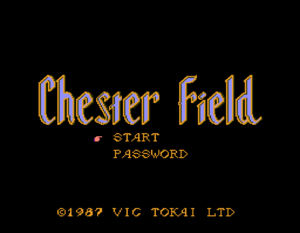 The presentation and gameplay of Chester Field is rather similar to Zelda II: The Adventure of Link. However, the animation is not quite as smooth, and the dungeon design is not as intuitive. The game was never released outside of Japan, but is fairly playable by non-Japanese speaking players. This game is notable for having a canceled American release. The game was commonly cited as a future release in a few Nintendo related publications, but it ultimately never saw the light of day. However, the game has been independently translated into English by translation group "Aeon Genesis", and the patch can be found and downloaded here. Once upon a time there was the kingdom of Guldred, that had been reigned by Gulse I. All his glory brought peace and joy to people. One day, the assassination of Gulse I changed the land of peace into the battleground. That was plotted by General Guemon. It was the critical moment of the Guldred kingdom. Under the circumstances, Gazem, an old knight advised Queen Liza and Princess Karen to ask Backviser for help. Backviser was King Gulse's old friend, who lived in the island of Chester Field. Liza and Karen decided to go there with Gazem. On their way to the island, unfortunately, their ship was attacked by Guemon's men. Gazem fought bravely against the pirates in vain; he got badly wounded and Liza was killed, and what is worse, Princess Karen was imprisoned somewhere in the island of Chester Field. The wounded knight drifted to the island, where he was treated by a young man named Kein. Gazem, however, breathed his last and after he told Kein all of his story. Deeply moved by his story, Kein decided to go on a journey to reconstruct the Guldred kingdom. He had to rescue Princess Karen from the hand of the enemy and to fight against Guemon. And then, the story of the young knight was beginning with the island of Chester Field...."
This page was last edited on 9 March 2010, at 14:54.